Skimboarding is a sport similar to surfing which takes place near the shore. The skimboarder stands about twenty feet from the ocean with skimboard in hand and waits for a wave. Unlike surfing, skimboarding begins on the beach by dropping the board onto the thin wash of previous waves. When they see a wave they run towards it with their skimboard still in hand. 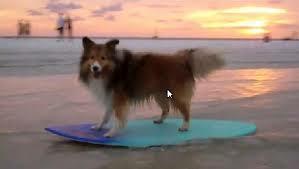 Upon reaching the wet sand they drop the board and jump onto it as quickly as possible. Once on the board, the skimmer must remain as stable as possible and prepare to make the transition to the ocean. The skimmer then (hopefully) glides out into the ocean toward the oncoming wave, banks off of it, and rides it back into shore. 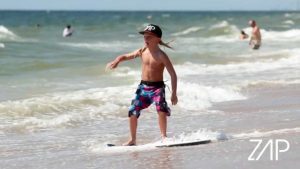 There are many possibilities for riding the waves and this is where skimboarding gets really interesting. St. George Island surf is perfect for skimboarding and we are happy to announce that you can get your ZAP skimboards here. Zap Skimboards is one of the most established and recognizable names in skimboarding, building boards for hundreds of thousands of riders all over the world since 1983 and made right here in Florida. Kids of all ages can enjoy the sport even the family dog can get in on the action. Check out one of my furry buds skimming. We have all sizes from adults to groms. So Mom and Dad bring your grom or grommet in today! Catch me on the next wave!